Sonya Precision Liquid Eyeliner is made with natural, quality ingredients to redefine your eyes whilst nourishing the skin. 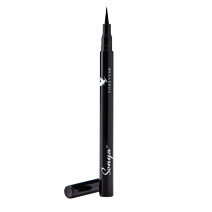 This quick-drying and smudge-proof liner creates a bold, dramatic look thanks to deep carbon pigment that creates rich black colour and crisp, sleek lines. With ingredients that are kind to the delicate eye area, including aloe vera, castor oil, sunflower seed oil and vitamin E, this eyeliner also soothes and moisturises skin. Aqua, Styrene/Acrylates Copolymer, Polyurethane-35, Laureth-21, Polygyceryl-2Caprate, Methylpropanedlol, PEG-40 Hydrogenated Castor Oil, Glycerin, Aloe Barbadensis Leaf Juice Powder, Helianthus Annuus Seed Oil, Ethylhexylglycerin, Butylene Glycol, Tri-C12-13 Alkyl Citrate, Caprylyl Glycol, Panthenol, Stearic Acid, Palmitic Acid, Citric Acid, Tocopherol Tetrasodium Glutamate Diacetate, Phenylporpanol, Phenoxyethanol Sodium Dehydroacetate, Cl 77266[nano].